I have the idea that there are still people who don't believe the Dossier B exists. My father published the book and that's why I have my own copy of the book in my hands. I will tell my story by footage and pictures. I hope that even the last critics will believe that the Dossier B exists! For those who still think “Le Dossier B” is fake…. The mysteries around Poelaert and his plans have always blaze up strange passion. For instance during the sixties: the writer Pierre Lidiaux. Good evening. I introduce you two new books. Château en Suède, the first book of Françoise Sagan, who I will talk to later tonight but first an young Belgium author, Pierre Lidiaux, who will talk with us about his book. You have published a new book, the Dossier B. A book that is hard to place. 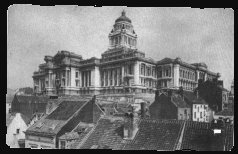 In this book the palace of Justice and its architect Poelaert play a principle part. Why your interest in this gigantic and awful building? I don't think it speaks of bad taste. Major Anspach said hundred years ago: “This monument will be the most beautiful and even the only one of the 19th century”. He wanted that it would costs as much as possible, to avoid the rumors that Brussels was niggardly. What makes today, in 1960, this palace of Justice still interesting? The building is esoteric. Everybody know that Poelaert was a freemason. The palace contains many signs, symbols and reminders of the freemasonry. But for me this all is only a mask. Poelaert was obsessed by the connection theory. I doubt the viewers can still understand you. I know many don't like to hear this interpretation. Though there is indisputable evidence. Like Poelaert who refused to show the final plans. He even sent them contradictory plans. The palace of Justice has a secret purpose for real. Poelaert wanted to connect Brussels with its parallel city. Brüsel. This search for the passage makes clear why this project was supported all the time by high sources. And this passage, where would this be? I can't tell you this in front of the camera. I needed 268 pages to explain this complex dossier. And the research still continues. There is still a lot of work to do. I don't doubt about that. Thanks. The title of this book: the dossier B. 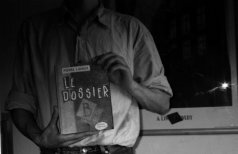 First meeting with Henri Vandebelle and finding out that every copy of “le dossier B” has been lost. … there is only one way to find. To read the book of Lidiaux. Dossier B? No, we don't have this book. Can't you tell me where I can find it? The book of Lidiaux is unfindable, the publisher went bankrupt and the author disappeared. Gladly in a small corner of the archives a few traces can still be found. Mr. Lidiaux was fascinated by the buildings of the Expo'58. Here he is in front of the “Kunstberg”…. The slums…. and the “Volkshuis”. Strange, all these places are now gone. That's why mr. Lidiaux was so interested. What did he look for at those places? The passage of course. First he thought it was in the palace of Justice, but later somewhere else in the city. That's why he made his movie. Pierre Lidiaux walking around in the museum about Wiertz. Pointing out that Wiertz knew about a passage. Of all the not understood artists of Brussels Antoine Wiertz, born 1806, died 1865, is the most remarkable. Wiertz came to Brussels in 1845, disappointed because one of his works had ended in a lottery in Paris. But how could the critics be so blind? Wiertz had showed it so beautifully. This painting on the wall of a half open door points at his great theme, the connection, the connection to Brüsel maybe. And besides it he paints a key. The key of the door, of his work and nobody have seen it. Come on, Brussels, stand up. Become capital of the world, making Paris fade. This is the point of his message, he painted close to the entrance. Wiertz was the first seer and prophet who was talking about Brussels as the capital of Europe. An interview with Paul van den Boeynants, former premier of Belgium. Of megalomania, no. But only the ambition to become big. The ambition to take its place against all price. That's true. We were small but we wanted to become big no mater what. Have the urbatectonic blunders of Brussels something to do with the influence of a parallel city, Brüsel? But no, that are only stories. The Authorities know the problem but don't let them drag along. There have been a few slips but that happen everywhere. An interview with De Pauw, one of the people who started the big changes in Brussels, about the Manhattan Project. Like New York we wanted a 400 meter tower, but that was not possible due to Zaventem. So we build four of 100 meter each. Yes, Brussels has known a huge expansion over the last 20 years. Now Brussels has become something special. But the people of Brussels are quick with their comments. If a building is brown, they want to see it become pink. I would like it too that all women look like Marilyn Monroe. They don't, but you don't hear me to criticize them. You may find a building of us ugly. But why make some many comments on them. If you don't like it, don't say anything. But if you like, say so. But I have never heard: that is beautiful. Van den Boeynants was kidnapped and after his release he told the press where he has been. A month after his kidnapping Paul van den Boeynants is released and gives a press conference. Vandebelle seems a key figure in the search for “le dossier B”. This part shows the house of Henri. I am not very surprised. Keeper of the records, collector Vandebelle has a beautiful collection of drawings of Robert Louis De la Barque. I get the feeling I am walking through the real Brussels. Now I understand the fascination these images must stimulate. Vandebelle tells about his discovery of a passage and the truth that is in the book “le dossier B”. One element is still missing in our dossier. When I was almost finished with the montage of my research I got a video in my box. Hi, Claire. May call you Claire? Since you have been at my place, we know each other a little. Yes, it was me who stole the Dossier B. You know, the part where Lidiaux writes that his book is only fiction is a lie and do you know why? 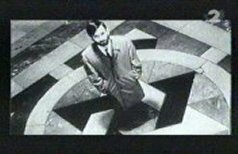 Because I, Henri Vandebelle, found the connection after searching for years. It's all in the book. Now I will go to Brüsel, and I will take this little camera with me. So soon Claire I will send you images from there. Goodbye. Goodbye, Claire.